Craft the perfect Customer Service cover letter by customizing our downloadable sample below. Save yourself some time by using our custom cover letter builder! Not in love with this template? Browse our full library of cover letter templates. In a hurry? Our state of the art cover letter builder can help you write a convincing cover letter in minutes. Otherwise, we highly recommend reading our comprehensive cover letter writing and formatting guide. I am writing to your regarding your company’s Customer Service Representative opening. I have been working as a Telephone Sales Executive at Telemarketer Auto Insurance USA for more than 2 years now and have developed impeccable phone manners, and an ability to deal with agitated or distressed customers. I am accustomed to working on multiple projects simultaneously, and can offer new ideas to help your company grow and surpass all goals and objectives. My duties included making 60 cold calls a day to business and private individuals to solicit sales for goods and services. During my tenure, I implemented a new sales strategy, reducing training expenses by 90% and increased the close ratio by 10% within 3 months. My experience at Telemarketer Auto Insurance USA has helped me improve my skills in leadership, allowed me to gain organizational skills, and has provided me with extensive knowledge of how to upsell services and goods to potential clients. I have also worked at Parade Hotel as a Front Desk Clerk where I provided information to guests in a 150+ room hotel & trained and supervised 6 new staff members. I am looking forward to discussing the position and my qualifications with you in more detail soon. I feel confident that I fulfill the requirements for the Customer Service Representative position. Thank you for your time and consideration. 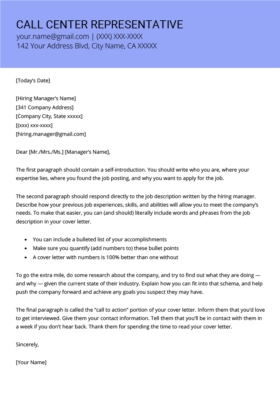 If you check out our cover letter builder, https://app.resumegenius.com/letters/new, you find a variety of general cover letter templates like the one below. Good luck on your job search! I would appreciate the opportunity to meet and further share with you my qualifications and enthusiasm for joining the [COMPANY] team. I invite you to review my attached resume and thank you for your consideration. thank you. 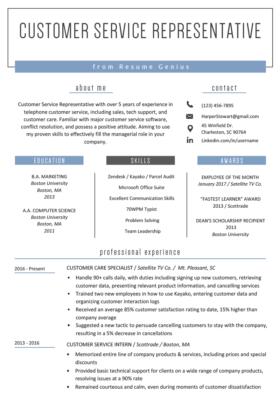 appreciated the help of completing my cover letter and resume. this is the professional way of writing a cover letter. thank you once again. Anita Malambaul of PAPUA NEW GUINEA. Glad that we were able to help you complete your cover letter and resume. Best of luck with your job search! According to one famous study, hiring managers only take an average of six seconds to decide whether to keep or trash your resume. 15 Reasons Why Your Perfect Resume Was Rejected How to Beat the Applicant Tracking Systems (ATS) Would You Rather Work for a Man or a Woman?